BACKGROUND AND PURPOSE: Extensive metabolic impairments have been reported in association with mesial temporal lobe epilepsy (mTLE). We investigated whether proton MR spectroscopy (1H-MRS) depicts metabolic changes beyond the hippocampus in cases of mTLE and whether these changes help lateralize the seizure focus. METHODS: MR imaging and 1H-MRS were performed in 15 patients with mTLE with a postoperative diagnosis of mesial temporal sclerosis and in 12 control volunteers. Point-resolved spectroscopy and multisection 1H-MRS measured N-acetylaspartate (NAA), creatine (Cr), and choline (Cho) in the hippocampus, temporal opercular and lateral cortices, insula and cerebellum, and frontal, parietal, and occipital lobes. Metabolites were assessed as ratios to Cr and in absolute units. RESULTS: Twelve patients had ipsilateral hippocampal atrophy; three had negative imaging results. In the ipsilateral hippocampus, absolute NAA (|NAA|) was 27.3% lower in patients compared with that in control volunteers (P < .001) and 18.5% lower compared with that in the contralateral side (P < .01). |NAA| averaged over selected regions in the ipsilateral temporal lobes of patients with mTLE was 19.3% lower compared with the mean in the control group (P < .0001) and by 17.7% lower compared with the contralateral values (P < .00001). Using only hippocampal data, 60% of the cases of mTLE were correctly lateralized. Lateralization, determined using whole temporal lobe data, had 87% sensitivity and 92% specificity. |NAA| was bilaterally reduced in the frontal, parietal, and occipital lobes of patients with mTLE compared with that in control volunteers (P < .01). CONCLUSION: Multisection 1H-MRS depicts interictal reductions of NAA in the ipsilateral temporal lobe beyond the hippocampus and accurately lateralizes seizure foci. Temporal lobe epilepsy (TLE) is the most frequent cause of focal and refractory seizures. Mesial temporal sclerosis is the pathologic finding in 65% of temporal lobectomy specimens from adults with TLE (1) and is associated with another potentially epileptogenic lesion (especially cortical dysgenesis) in 15% of cases (dual pathology) (2). Mesial temporal sclerosis displays neuronal loss in the hippocampal formation, with accompanying astrogliosis that most severely affects the CA1 sector and then the CA3 sector and the hilus of the dentate gyrus (3). Margerison and Corsellis (4) reported extrahippocampal, presumably hypoxic, changes in the cerebellum, amygdala, thalamus, and neocortex in cases of TLE. MR imaging depicts mesial temporal sclerosis with high sensitivity (5) and also provides a means of quantifying hippocampal volume and T2 relaxation abnormalities, which are correlated with the extent of neuropathologic changes (6). However, even after volumetric and relaxation MR imaging studies, 20% of patients with TLE have negative MR imaging findings (7). Patients with intractable seizures are evaluated for surgical treatment, which aims at resecting the epileptogenic lesion. Preoperative MR imaging can help predict the outcome of temporal lobectomy: patients displaying hippocampal sclerosis have substantially better outcomes than do patients with normal MR imaging findings (8). 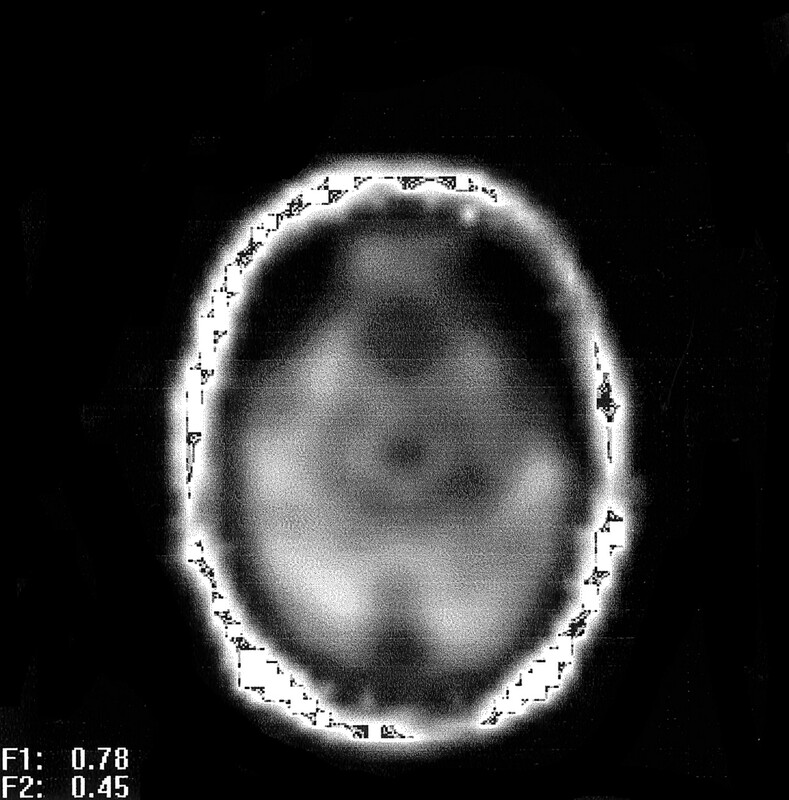 An additional technique used in the presurgical evaluation is positron emission tomography (PET), which depicts interictal glucose hypometabolism ipsilateral to the epileptogenic focus in cases of TLE (9). The region of glucose hypometabolism is typically larger than the pathologic lesion and frequently involves the lateral temporal lobe as much as or more than the medial region (10). Patients with TLE undergo a remarkable variety of ictal experiences, suggesting an extensive anatomic substrate. Despite use of the term temporal lobe epilepsy, insular, orbitofrontal, and cingulate areas play an important role in the generation and spread of these seizures (11). Proton MR spectroscopy (1H-MRS) is a noninvasive technique that depicts the anatomic distribution of metabolite signals, including those of compounds containing N-acetylaspartate (NAA), creatine and phosphocreatine (Cr), and choline (Cho). NAA is almost exclusively concentrated in neurons in the adult nervous system of a number of species and has been used as a neuronal marker in 1H-MRS studies (12, 13). This laboratory (14–16) and others (17, 18) have shown that NAA is reduced in the ipsilateral hippocampus and mesial temporal lobe, thus lateralizing the seizure focus in TLE. The NAA decline has been considered to reflect neuronal loss; however, reversible decreases in NAA that could indicate metabolic impairment have been reported (19). In a recent study that used multisection 1H-MRS to evaluate metabolite changes outside the hippocampus in cases of TLE, diffuse reductions of NAA in the ipsilateral, and to a lesser extent, contralateral hemisphere were shown in addition to changes in the ipsilateral hippocampus (20). Therefore, the overall goal of this study was to determine the extent to which metabolite changes occur outside the hippocampus in cases of TLE, especially in the temporal lobe. This was achieved by using a multisection 1H-MRS technique with angulation that facilitated the measurement of metabolites in the hippocampus, mesial and lateral temporal cortex, and frontal, parietal, and occipital lobes. On the basis of studies cited and the previous work from this laboratory, we formulated the following hypotheses: 1) Patients with TLE have reduced NAA in the ipsilateral hippocampus compared with NAA in the contralateral side or in control volunteers. 2) Throughout the temporal lobe (ie, in the temporal opercular and lateral temporal cortices) and in the ipsilateral insular cortex, patients with TLE have reduced NAA compared with NAA in the contralateral side or in control volunteers. 3) Metabolite information from outside the hippocampus can provide improved lateralization of TLE. The present study was designed as a case-controlled horizontal study. Twenty-seven participants were included. Informed consent was obtained from all participants according to guidelines of the University of California, San Francisco Committee on Human Research. Fifteen patients (seven women and eight men; mean age, 35.6 ± 12.6 years) with clinical, radiographic, electrophysiologic, and pathologic diagnosis of unilateral nonlesional mesial TLE (mTLE) were studied. Criteria for clinical diagnosis were reported previously (16). In summary, diagnosis of nonlesional unilateral TLE was based on the following criteria: 1) no lesion revealed by diagnostic MR imaging other than mesial temporal sclerosis; 2) focal ictal temporal lobe patterns recorded with scalp-sphenoidal EEG or mesial temporal seizure onset in patients requiring subdural or depth electrode recordings; 3) EEG recording of at least three spontaneous seizures and no independent contralateral seizure onsets; and 4) clinical features consistent with seizures of temporal lobe origin. Patients could be divided into three groups according to history of generalized seizures as follows: four patients with no history of generalized seizures, five patients with up to three isolated episodes of generalized seizures during their lifetime, and six patients with different frequency of recurrent generalized seizures ranging from three to four per month to one per year. The sum of all clinical information, on the basis of which surgery was decided, was taken as the criterion standard of lateralization for comparison with MRS results. All patients underwent ipsilateral tailored temporal lobectomy and amygdalo-hippocampectomy, which pathologically confirmed mesial temporal sclerosis in all cases. Postsurgical mean follow-up (± SD) was 30 (± 6.5) months (range, 20–42 months). Surgery outcome expressed according to Engel’s classification (21) was as follows: 11 patients in category 1 (seizure free), three in category 2 (rare disabling seizures, “almost seizure free”), and one in category 3 (worthwhile improvement with >90% reduction of seizure frequency). Three cases of mTLE were lateralized to the right temporal lobe and 12 were lateralized to the left. Twelve healthy volunteers (six women and six men; mean age, 31 ± 10 years) were studied as a control group. All MR imaging was performed using a 1.5-T Magnetom VISION unit (Siemens, Erlangen, Germany) with a standard circularly polarized head coil. After scout images were obtained, the following MR imaging protocol was completed: 1) T1-weighted fast low-angle shot in a tilted axial plane parallel to the long axis of the hippocampus as defined in the sagittal scout images (500/14 [TR/TE]; flip angle, 70°; section thickness, 3 mm); 2) axial proton density–weighted and T2-weighted spin-echo oriented parallel to the roof of the orbits (2550/20/80 [TR/TE1/TE2]; in-plane resolution, 1.4 × 1 mm2; section thickness, 3 mm); 3) coronal 3D T1-weighted gradient-echo orthogonal to the T1-weighted fast low-angle shot (magnitude prepared rapid-acquisition gradient-echo; 10/4; flip angle, 15°; in-plane resolution, 1.0 × 1.0 mm2; section thickness, 1.4 mm). Two 1H-MRS sequences were run. For the first sequence, after localized shimming, a 2D-MRS sequence with point-resolved spectroscopy (PRESS) volume preselection (1800/135) was acquired. It was positioned parallel to the axis of the hippocampus, covering both hippocampi and adjacent mesial temporal lobes (Fig 1A). The length and width of the volume of interest were adjusted for each individual case, depending on head size, whereas section thickness was set to 15 mm in all cases. Field of view was 210 × 210 mm. Circular k-space sampling (22) equivalent to a maximum of 24 × 24 phase-encoding steps was applied, with a nominal voxel size of 8.75 × 8.75 × 15 mm3. Measurement time was 13 minutes 30 seconds. For the second sequence, a multisection MRS sequence (1800/135) consisting of three 15-mm-thick sections was measured parallel to the T2-weighted images. The orientation was made parallel to the roof of the orbit to reduce lipid contamination from orbital fat. The lower section (temporal section) intercepted the body of the hippocampus, the middle section (ventricular section) was placed right below the inferior aspect of the body of the corpus callosum, and the upper section (supraventricular section) was placed slightly above the body of the corpus callosum (Fig 1B). Lipid contamination of the metabolite spectra was reduced by using a section-selective inversion pulse, with an inversion time of 170 ms that resulted in nulling of the lipid signal intensity. The equivalent of 36 × 36 phase-encoding steps over a circular k-space region was sampled (22), yielding a nominal voxel size of approximately 8 × 8 × 15 mm3. Measurement time was 35 minutes. Water suppression for both 1H-MRS studies was achieved with chemical shift selective pulses (23). Parasagittal scout MR images. A, Section positioning of the PRESS sequence. B, Multisection 1H-MRS imaging sequence. Postprocessing of the MRS data was accomplished by using software presented elsewhere (24, 25). Zero filling from 512 to 1024 time domain data points and 4 Hz gaussian multiplication in the spectral domain was applied before Fourier transformation. Spatial domain data were zero filled to 32 × 32 k-space points for PRESS and to a 64 × 64 matrix for the multisection data. Mild apodization filtering was applied, yielding effective voxel sizes of 2.4 and 1.86 mL, respectively. The relative metabolite concentrations corresponding to the peaks of NAA, Cr, and Cho were calculated by using a least-squares spectral fitting procedure. This included automatic phasing, baseline correction, and a Lorentz-Gauss line shape assumption. Because the fit procedure returned the relative number of molecules, the results were corrected for differences in the number of protons contributing to each of the fitted resonances (three for NAA, three for Cr, and nine for Cho) to enable direct comparison of the reported ratios with literature values. Absolute metabolite signals of NAA, Cr, and Cho were obtained by correcting the raw signal intensity for coil loading and receiver gain and were further normalized to the mean signal intensity of CSF on the proton density–weighted images to account for potential system instability. Absolute metabolite signals are thus presented in institutional units. Voxel selection was performed with software developed in house (24), which allows for anatomic delineation of regions of interest in the MRS data set on coregistered MR images. Spectra from the mesial temporal lobes, including the hippocampi (from head to tail), were extracted from the PRESS data set by following guidelines defined in a previous study (15). Voxels from the hippocampal body, opercular temporal cortex, insular cortex, lateral temporal cortex, and cerebellar hemispheres were selected from the temporal section of the multisection data set (Fig 2). Representative PRESS spectra of both hippocampi from a patient with left mTLE are shown in Figure 3. In each region, voxel pairs were chosen in right and left symmetric positions with respect to the anterior-posterior direction. Spectra from the ventricular and supraventricular sections encompassing frontal, parietal, and occipital lobes were collected from each hemisphere. The voxels were then arranged into symmetric pairs on each side of the midline by a program written “ad hoc” (P.V.). All right-left voxel pairs were then used to calculate the asymmetry indices. This approach was chosen to avoid regional differences in metabolite distributions. An average of 461 voxels pairs in the ventricular and supraventricular sections was entered in the analysis for each TLE. 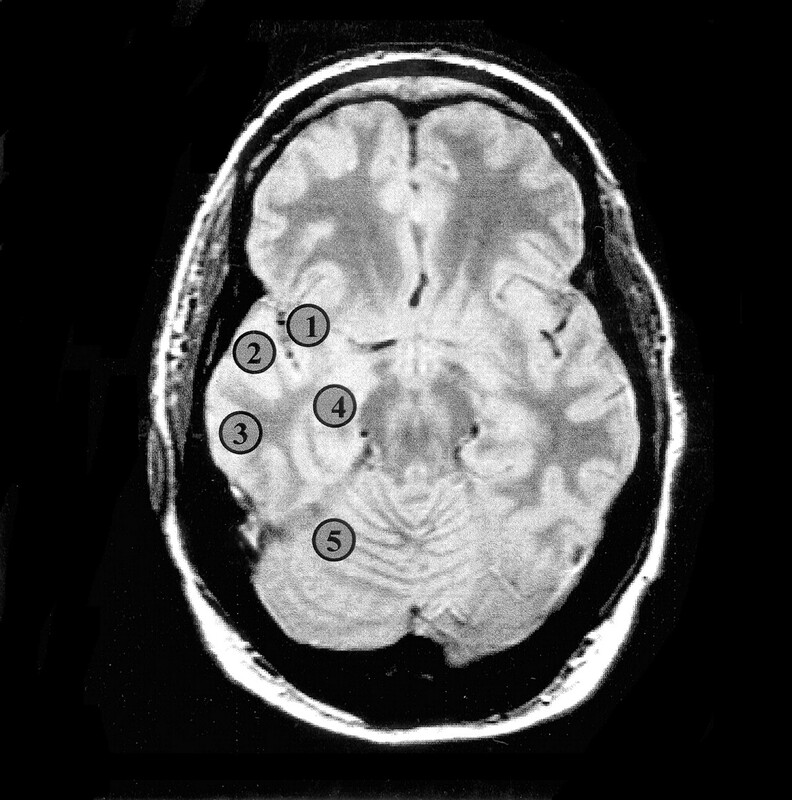 Oblique axial proton density–weighted image corresponding to the temporal section of the multisection 1H-MRS sequence of a patient with right mTLE shows regions for voxel selection: 1, insula; 2, temporal operculum; 3, lateral temporal cortex; 4, hippocampal body; 5, cerebellar hemisphere. Scout axial MR image (center) for PRESS sequence, encompassing both hippocampi. Spectra from right and left hippocampus are shown with NAA reduction on the left side in this case of left mTLE. a.u., absolute units. , where (v) refers to the following: |NAA|, NAA/(Cr + Cho), AF|NAA| or AFNAA/(Cr + Cho). Average absolute signal intensity, ratio, and AFs in each region in cases of mTLE were compared with the mean of the control group by using one-tailed unpaired t tests. Ipsi- and contralateral sides in cases of TLE were compared using one-tailed paired t tests. We hypothesized, a priori and on the basis of our previous work, that mTLE has lower ipsilateral |NAA| and NAA/(Cr + Cho) compared with that in the contralateral side and with the mean of the control group in the hippocampus, insular, opercular, and lateral temporal cortices. The AF for these measures was expected to be higher in cases of TLE compared with the AF in the control group. The criteria for lateralization, based on the MRS data, were as follows. Temporal lobe |NAA| or NAA/(Cr + Cho) values <2 SD of the mean of the control group were considered abnormal. This could be either unilateral or bilateral. If unilateral, the side of the abnormal value was considered to be the abnormal side. If both sides were abnormal with an absolute AF ≥12% (16), the side of the lower value was considered to be the abnormal side, whereas if the absolute AF was <12%, no lateralization was defined. Temporal lobe right-left |NAA| or NAA/(Cr + Cho) absolute AF >2 SD of the absolute mean asymmetry of the control group was considered abnormal, even if |NAA| and the ratio were within the normal range. The side of lower |NAA| or ratio was considered to be the abnormal side. Twelve patients had ipsilateral hippocampal atrophy revealed by high-spatial-resolution MR imaging (qualitative assessment); three had negative MR imaging results. Table 1 lists hippocampal |NAA| and Table 2 lists NAA/(Cr + Cho) for the control and mTLE groups, as obtained by the PRESS technique. The ipsilateral hippocampal |NAA| in the mTLE group was significantly reduced compared with both the mean of the control group (15.9% reduction, P < .05) and the contralateral hippocampus (−9.7%, P < .01). NAA/(Cr + Cho) ratio was significantly reduced in the ipsilateral hippocampus compared with the ratio in both the control group (P < .01) and the contralateral side (P < .05). No significant difference in |NAA| was observed between the contralateral hippocampus in the mTLE and the mean of the control group. No significant differences in absolute AF were detected between cases of mTLE and the control group. Tables 1 and 2 show |NAA| and NAA/(Cr + Cho) values in the brain regions studied. Figure 2 shows regions used for voxel selection in the hippocampal body, opercular temporal cortex, insula, lateral temporal cortex, and cerebellar hemispheres. Figure 4 displays NAA metabolite images of a control volunteer, and Figure 5 is an NAA metabolite image obtained at the temporal section of a left mTLE. All three ipsilateral hippocampal metabolite signals obtained by multisection MRS in cases of mTLE were reduced compared with those in the control group, with a 27.3% reduction in |NAA| (P < .001), a 11.6% reduction in |Cr| (P < .05), and a 16.0% reduction in |Cho| (P < .05). |NAA| ipsilateral to the EEG-defined focus was 18.5% reduced relative to the contralateral side (P < .01), whereas no significant asymmetries were found for |Cr| and |Cho|. NAA/(Cr + Cho) was also diminished in the ipsilateral hippocampus compared with ratios in the control group (P < .01) and the contralateral side (P < .0001). The contralateral hippocampus of patients had 10.72% lower NAA levels compared with those in the control group, but this difference was not statistically significant (P = .19). Four patients had contralateral hippocampal NAA >2 SD below that of the mean in control subjects. This renders a 27% occurrence of contralateral abnormality. NAA metabolite images obtained in a control subject. A, Ventricular section (note the low signal intensity from the lateral ventricles). B, Supraventricular section as defined on sagittal scout images (see Fig 1B). NAA metabolite image of a left mTLE shows reduced NAA signal intensity on the anterior left temporal lobe. The ipsilateral opercular |NAA| was reduced compared with both the mean of the control group (17.1%, P < .001) and that of the contralateral side (17.9%, P < .001). NAA/(Cr + Cho) in the ipsilateral operculum followed the same trend as |NAA|, being significantly lower than that in the control group (P < .001) and contralateral side (P < .001). |NAA| in the ipsilateral insula was reduced compared with that in control subjects (19.6%, P < .01) and that in the contralateral insula (18%, P < .00001). Insular NAA/(Cr + Cho) was also lower ipsilaterally compared with ratios in the control group and the contralateral side (P < .001). No significant changes in |Cr| or |Cho| were detected in the operculum and the insula. Lateral temporal cortex |NAA| was reduced ipsilaterally in comparison with the control group (24.9%, P = .001) and with the contralateral side (19.1%, P < .05), as was the NAA/(Cr + Cho) ratio (P < .05 for both the control group and the contralateral side). No metabolite changes were detected in the cerebellar hemispheres across groups or between sides. No significant differences in NAA concentration were shown among the three subgroups of patients with different histories of generalized seizures. Absolute AFs from cases of TLE were compared with the corresponding AFs in the control group for all four defined regions. AF|NAA| in the hippocampus (P < .05), temporal operculum (P < .01), and insula (P < .001) were significantly higher in the mTLE group than in the control group. The mean ipsilateral |NAA| value was lower than the contralateral value in all these regions. No significantly increased AF|NAA| was found, either in the cerebellar hemispheres or in the lateral temporal cortex. AF|Cr| was significantly higher in the mTLE group compared with that in the control group in the temporal operculum (P < .01) and insula (P < .05), with the ipsilateral side showing lower |Cr|. AFNAA/(Cr + Cho) in the hippocampus (P < .01), operculum (P < .01), insula (P < .01), and lateral cortex (P < .05) were higher in the mTLE group than in the control group. No difference in AFNAA/(Cr + Cho) between the cerebellar hemispheres was detected between the mTLE and control groups. Composite scores used for lateralization were as follows: the control group had a mean CS|NAA| of 1.09 ± 0.08, which was reduced to 0.88 ± 0.15 (−19.3%, P < .0001) in cases of ipsilateral mTLE and to 1.07 ± 0.15 (P = not significant) for the contralateral side. CSNAA/(Cr + Cho) was 1.44 ± 0.15 in the control group and dropped to 1.2 ± 0.2 (P = .001) in cases of ipsilateral TLE, whereas in the contralateral side, it was 1.43 ± 0.2 (not significant). Regarding asymmetry, the control group had a CS AF|NAA| of 8.76 ± 4%, whereas for cases of TLE, it increased to 19.36 ± 11.1% (P < .01). CS AFNAA/(Cr + Cho) was 8.7 ± 3.1% in the control group, and in cases of TLE, it increased to 20.4 ± 12.4% (P < .01). Data from the supratemporal sections, including the frontal, parietal, and occipital lobes, are presented in Tables 1 and 2. The mTLE group had reduced |NAA|, both in the ipsilateral hemisphere (7.6%, P < .01) and in the contralateral side (7%, P = .01), compared with that in the control group. No significant differences in |NAA| were detected between ipsilateral and contralateral hemispheres in cases of mTLE. No significant changes were found for |Cr| and |Cho|. Finally, NAA/(Cr + Cho) in the mTLE group was decreased compared with that in the control group in the ipsilateral hemisphere (6.9% difference, P < .01), with a trend for a reduction in the contralateral side (3.2%, P = .09). The ipsilateral ratio was 3.8% lower than the contralateral ratio (P < .001). AFs were calculated for pairs of voxels in symmetric positions regarding the interhemispheric fissure. No significant differences in AFs were detected between cases of mTLE and the control group for |NAA|, |Cr|, |Cho|, or NAA/(Cr + Cho). In summary, significant metabolite changes were detected in the frontal, parietal, and occipital lobes of patients with mTLE when compared with mean values for the control volunteers, but no significant asymmetries were found. Table 3 summarizes the lateralization data for 15 patients with mTLE. For the purpose of lateralization, data from the hippocampal PRESS and temporal section were used, following the protocol described in the Methods section. When using only the hippocampal data (either from PRESS or multisection sequences), nine (60%) of 15 cases of mTLE fulfilled the lateralization criteria (in all these cases, ipsilateral to EEG). After combining the data from the selected temporal lobe regions, 10 patients had abnormal temporal section CS|NAA|, three of them bilaterally. The seven who had unilaterally abnormal temporal section CS|NAA| had lateralization in agreement with EEG. Of the three with bilateral |NAA| reduction, two had correct lateralization with AFs of −31.3% and −23%, whereas the other did not have lateralization, because his AF was below the 12% threshold. Temporal lobe CS AF|NAA| was abnormal in eight cases of mTLE, all of which were correctly lateralized. Regarding the NAA/(Cr + Cho) ratio, six cases of mTLE had abnormal CSNAA/(Cr + Cho), five unilaterally and one bilaterally. All cases with unilaterally abnormal CSNAA/(Cr + Cho) were correctly lateralized. The case with bilateral abnormality had an AF of −8.8%, which was concordant with EEG yet lower than the threshold of 12%; thus, it was not lateralized by this measure. Ten patients had abnormal CS AFNAA/(Cr + Cho). Nine of these cases were correctly lateralized, and one was incorrectly lateralized. The two nonlateralized cases had both lower ipsilateral |NAA| in the hippocampus revealed by PRESS and lower ipsilateral CSNAA/(Cr + Cho) and CS|NAA| but did not reach the strict lateralization criteria set forth in this study. The one misclassified case (Table 3, patient 13; negative MR imaging findings) had MR-negative left TLE and Engel’s class 1 after surgery, with a follow-up of 30 months. Temporal lobe multisection data for this case were of suboptimal quality, with the temporal opercular region being the only one acceptable for data analysis. The grounds for lateralizing this case to the right temporal lobe was a higher level of both Cr and Cho on the right operculum, although NAA was lower on the left side (with both PRESS and multisection 1H-MRS). This resulted in a lower NAA/(Cr + Cho) on the right opercular region with an asymmetry >18%, yielding positive lateralization by using the objective criteria set forth in this study. In summary, 13 of a total of 15 cases of mTLE were lateralized (sensitivity = 87%) on the basis of at least one measure that fulfilled the lateralization criteria, with 12 cases lateralized in agreement with EEG findings (specificity = 92%). The major findings of this study were as follows. mTLE had reduced |NAA| in the opercular temporal cortex, lateral temporal cortex, and insular cortex in the ipsilateral side compared with that in the opposite side and the control group. mTLE displayed a bilateral |NAA| reduction over the cerebral hemispheres in both the ipsilateral and the contralateral sides compared with |NAA| in the control group. Similar to previous reports, mTLE had reduced |NAA| in the EEG-defined ipsilateral hippocampus compared with |NAA| in the contralateral side and the control group. A composite score of NAA asymmetry in regions involved in complex partial seizures improved sensitivity and specificity in mTLE lateralization over hippocampal data alone. No asymmetry existed in the metabolite distribution between the cerebellar hemispheres in cases of mTLE. The first finding was the reduction in |NAA| in the ipsilateral temporal lobe structures in mTLE beyond the hippocampus. This is in agreement with PET data (10) that showed extensive temporal glucose hypometabolism in TLE. These regions were chosen for spectral analysis because of their involvement in complex partial seizures, as evidenced by anatomic (11) and PET (26) studies, and because of our ability to obtain good quality spectra in them with the multisection technique. Metabolic impairment in these regions in cases of TLE can be ascribed to their anatomic connections with areas of neuronal loss (eg, the hippocampus) (26). Opercular temporal cortex in the superior temporal gyrus consists mostly of auditory association cortex. It is reciprocally connected to paralimbic areas (including the parahippocampal gyrus), as well as parietotemporal and frontal areas (27). Lateral and ventral temporal cortices are densely associated with the hippocampal formation via multisynaptic pathways in monkeys (28). The insula is considered a component of the insulo-orbito-temporopolar complex, displaying a remarkable heterogeneity in connectivity and physiology (11). The insula is reciprocally connected with a variety of neocortical areas (sensory, motor, and association areas), olfactory cortex, amygdala, paralimbic regions including extensive areas of the temporal lobe, and the thalamus (11). Interictal ipsilateral temporal lobe hypometabolism affecting the aforementioned regions has been reported in association with TLE in a number of fluorine-18-fluorodeoxyglucose-PET studies (9, 26, 29). The reduction of glucose uptake was found to be independent of neuronal loss in surgically resected temporal lobe specimens (29–31) and more extensive than the area of pathologic involvement (9). Furthermore, lateral temporal hypometabolism was detected more frequently and to a greater degree than mesial hypometabolism in cases of mTLE (29). The pathophysiology of these metabolic changes in association with mTLE is not well understood. Henry et al (26) proposed that chronic metabolic dysfunction in areas connected with regions of neuronal loss could be responsible for the widespread interictal hypometabolism in mTLE. Likewise, NAA changes in TLE cannot be solely attributed to neuronal cell depletion. Reversible NAA decrements in mTLE that recover after successful epilepsy surgery (32) suggest transient neuronal metabolic impairment due to seizures. Other experimental and clinical studies also reported reversible |NAA| decrements in different conditions (33, 34). Moreover, a close correlation among mitochondrial NAA synthesis, ATP production, and oxygen consumption was established in vitro (35) and a positive correlation between NAA/(Cr + Cho) and fluorine-18-fluorodeoxyglucose-PET hypometabolism in unilateral TLE was shown (36). Our finding of reduced ipsilateral |NAA| in regions connected with paralimbic structures in mTLE is consistent with the widespread metabolic impairment detected with fluorine-18-fluorodeoxyglucose-PET. Of particular note is that regions in the temporal section beyond the hippocampus displaying |NAA| reduction appeared normal on MR images, because all patients included in this study were free of any brain lesion other than in mesial temporal sclerosis. We propose that the |NAA| decline in mTLE in areas involved in the generation or spread of seizures reflects abnormal metabolism secondary to altered physiology. The practical clinical value of defining such widespread temporal lobe metabolic abnormality in cases of mTLE consists of a larger metabolic abnormality ipsilateral to the seizure focus makes it more likely to lateralize the seizure focus. Furthermore, most of the NAA decrement occurs in normal-appearing tissue, enhancing the role of MRS in providing additional information to MR imaging for mTLE lateralization. No relationship between history of generalized seizures and extension of metabolic abnormalities could be established in this study, although patients’ subgroups were too small for definitive conclusions. Finally, we are not advocating that most of the temporal lobe should be surgically resected because of these metabolic abnormalities. We think that these metabolic anomalies are related to seizure activity and may then reverse after seizure control, as was previously shown for contralateral mesial temporal changes (32). Future follow-up studies of our patients will test this assertion. The second finding of the present study was a diffuse hemispheric |NAA| reduction in mTLE in both the ipsilateral and contralateral sides of the frontal, parietal, and occipital lobes. Previous evidence in the literature also suggests involvement of these brain regions in mTLE. In a previous study from this laboratory (20) diffuse metabolic changes outside the mesial temporal lobe were detected. Temporal and frontoparietal gray matter volumes were reported to be bilaterally reduced in cases of TLE, with no significant differences between epileptogenic and nonepileptogenic hemispheres, whereas hippocampal volumes were lateralizing (37). Glucose metabolism was found to be reduced over all supratentorial areas on the side of the epileptogenic temporal lobe (26). Thalamic and basal ganglial glucose metabolism was bilaterally reduced and correlated with hippocampal cell density in a patient with mTLE who underwent anterior temporal lobectomy (38). The bilaterality of subcortical metabolic changes was interpreted on the basis of the bilateral efferent projections from the hippocampus to these subcortical structures. Contrary to this, other investigators did not find significant correlations between hippocampal neuronal density and cortical metabolic asymmetry in any cortical area (31, 39). We interpret the hemispheric |NAA| reduction in frontal, parietal, and occipital lobes to result from the same factors that cause NAA reductions in the ipsilateral temporal lobe outside the hippocampus. We postulate that hemispheric NAA reduction is a metabolic consequence of repetitive seizures and is not due to widespread ipsilateral neuronal loss. These preliminary results will be followed up after epilepsy surgery to define whether a recovery in |NAA| occurs after seizure control. Neuronal cell loss is an essential feature of mesial temporal sclerosis. The third finding of this study was |NAA| reduction in the ipsilateral hippocampus in cases of mTLE, which is consistent with the concept of NAA as a surrogate of neuronal density (12, 13), although additional metabolic impairment has recently been suggested (32). Previously published work (14–18) also found reduced hippocampal |NAA| or NAA/(Cr + Cho) or both in cases of mTLE, including cases with negative MR imaging findings. The preeminence of NAA decrement over Cr and Cho changes implies predominant neuronal involvement, either by cellular loss or metabolic impairment. Previous investigators of TLE have reported variable changes in Cr and Cho. A single-voxel study showed an increment of these resonances in the ipsilateral temporal lobe (17), consistent with gliosis, whereas a previous study from this laboratory (15) showed a 10% reduction (not significant) in Cr in the ipsilateral hippocampus. The higher consistency of the NAA decrement regarding Cr and Cho changes across different studies confirms the greater selective neuronal impairment in mTLE. This selectivity makes spectroscopy theoretically more sensitive than MR imaging for detecting hippocampal abnormalities in cases of mTLE. The fourth finding of this work concerned the lateralization of mTLE by using the aforementioned 1H-MRS data. PRESS hippocampal AF|NAA| was concordant with EEG in 73.3% of patients and discordant in four (26.7%) of 15. However, overlap existed in AF between the mTLE and control groups, with only three mTLE cases having AF|NAA| >2 SD of the mean of the control group. This may be partially because of the presence of contralateral |NAA| reduction in cases of mTLE, which was 7.10% lower than in the control group, thus reducing the AF. Furthermore, if only the hippocampal spectra were considered, only nine (60%) of 15 cases of mTLE reached the lateralization criteria. Therefore, inclusion of additional data from other regions involved in the disease process is desirable to increase sensitivity and specificity of TLE lateralization. The combined |NAA| asymmetry score of four regions involved in the pathophysiology of TLE lateralized 13 of the 15 cases of mTLE, resulting in a sensitivity of 87%. Twelve of the 13 cases of mTLE that were lateralized were concordant with EEG findings, resulting in a specificity of 92.3%. Two cases did not fulfill the strict lateralization criteria set forth in this study but still had lower ipsilateral |NAA| in the hippocampus compared with that in the contralateral side. The only mTLE case that was incorrectly lateralized was so done on the basis of NAA/(Cr + Cho) asymmetry between the opercular regions because of a higher ipsilateral decrease in Cr and Cho than NAA, the latter being lower on the ipsilateral side. Because of this case, we urge caution when lateralizing with metabolite signals other than NAA, which is the only one specific to the neuronal compartment selectively affected in TLE. The higher sensitivity of the multisection data compared with that of PRESS in lateralizing mTLE could be partly due to the higher number of voxels analyzed in the temporal section as compared with the PRESS box. Additionally, a better spectral quality was achieved with the multisection sequence, particularly in the insula and temporal opercular cortex. Finally, the multisection technique samples regions of the temporal lobes not assessable with PRESS, where important metabolic changes occur in mTLE, as shown with PET studies. The inclusion of these regions in MRS examinations of patients with mTLE may improve the lateralization of the seizure focus over the lateralization derived from studies limited to the hippocampus. Cerebellar hemisphere |NAA| neither differed between patients with mTLE and control volunteers nor exhibited asymmetry between sides. Margerison and Corsellis (4) reported a high frequency (45%) of cerebellar hypoxic damage in their series of patients with epilepsy who were followed up to autopsy. Functional cerebellar abnormalities in the temporal lobes associated with mTLE are less well characterized and include ictal hyperperfusion contralateral to the seizure focus, as measured with ictal single photon emission CT (40). We acquired high-quality spectra from the cerebellar hemispheres and found a symmetric metabolic distribution both in the mTLE and control groups. We analyzed the cerebellar spectra to use them as an internal reference for the symmetry of signal intensity, because we did not expect cerebellar NAA asymmetry in cases of TLE. If any asymmetry were to be expected, it would be reversed relative to the temporal lobe findings because of the crossed cerebellar diaschisis phenomenon (41). The contrast between the strong lateralizing |NAA| asymmetry in the temporal lobes in cases of mTLE and the symmetry for the cerebellar hemispheres suggests that the pathophysiology involving the cerebellum differs from that involving the temporal lobes. This study has several limitations. Follow-up MRS studies of patients after surgery will allow the determination of the potential reversibility of the |NAA| decrement and its association with clinical outcome. Furthermore, this study did not obtain T1 and T2 measurements of the metabolites. Consequently, the metabolite changes could not be presented in units of concentration. Therefore, it cannot be ruled out that some of the metabolite differences between the cases of mTLE and the control group were due to T1 and T2 changes and not to differences in the metabolite concentration. Finally, improvement in the multisection MRS technique will make it possible to sample other brain regions affected in cases of mTLE, such as the thalami (26), which could not be selected in this study because of partial volume problems. This study shows extensive reduction of NAA in areas of the temporal lobe and insular cortex in cases of mTLE. Symmetric generalized reduction of NAA also occurs in the frontal, parietal, and occipital lobes. These NAA changes probably reflect metabolic impairment due to repeated seizures. The NAA asymmetry in the temporal lobe and insular cortex robustly lateralizes the seizure focus in cases of mTLE. Supported by National Institutes of Health grant RO1-NS31966. Accepted after revision April 22, 2002.